View looking down Park Street toward Tremont Street. 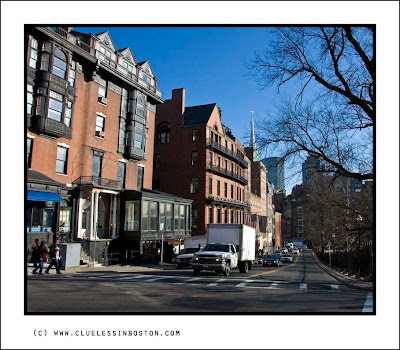 Park Street begins at the top of Beacon Hill, at the intersection of Beacon Street, where it is lined up with the front of the Massachusetts State House. It borders the Boston Common on the right (west). This is the view looking up Park Street. This is a very posh neighborhood, very convenient to downtown, restaurants, cultural attractions, etc. Thanks for the new year greetings -a bit tardy in reply - I am on holidays! I would have liked to see that place under the snow! A charming shot of a charming street. Charming neighborhood, love the place. So, will we see a snow pic of this scene tomorrow? Look at that gorgeous blue sky!